Welcome! I’m so glad to have you here! 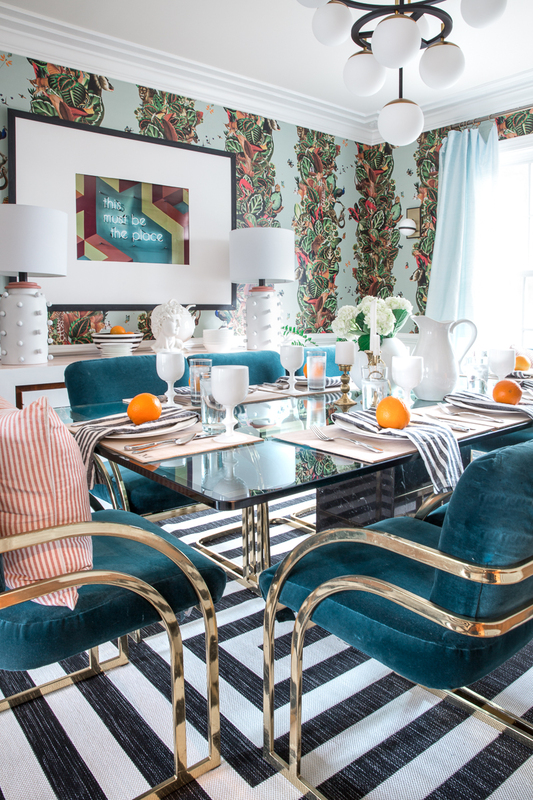 You may remember waaaayyyy back to December when we did a It’s a Colorful Life Holiday Home Tour? 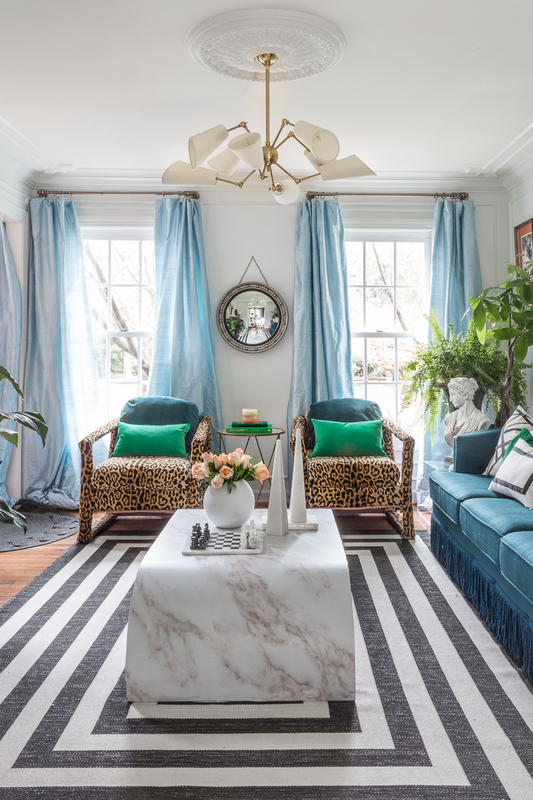 Weeeellllll, we had SO much fun that we are at it again…This time, however, I’m teaming up with Jennifer, from Dimples and Tangles to bring you the SPRING Home Tour…So pull up a comfy seat, kick up your feet, and get ready to tour some incredibly lovely and colorful homes. 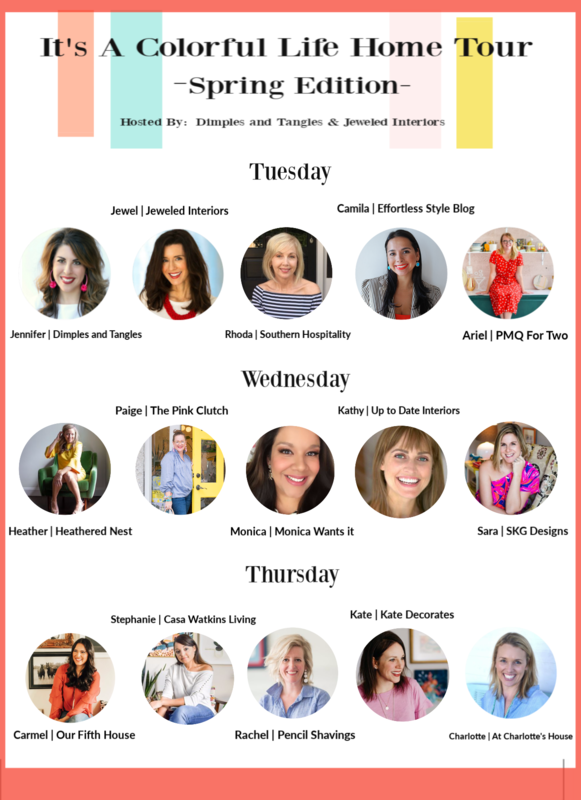 Make sure to check out each of the fifteen talented bloggers who will be opening their homes over the next 3 days (Links at bottom). 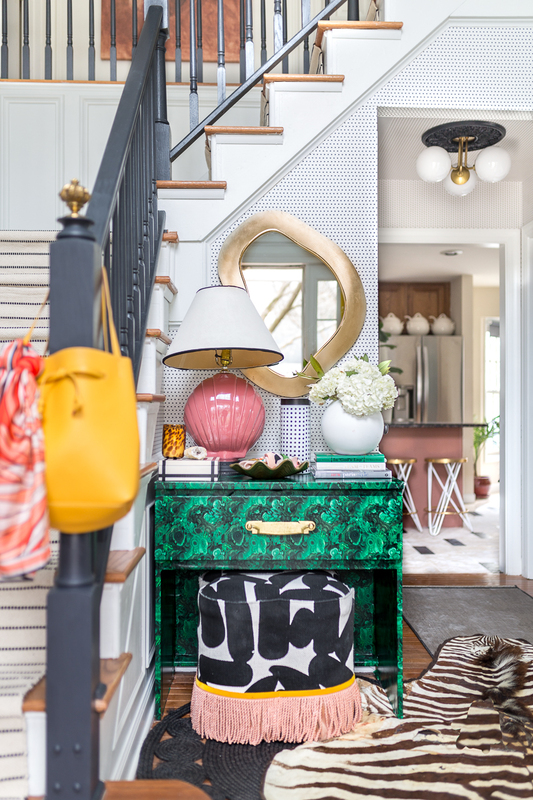 Note: Most of the products listed in the Spring home tour were originally sponsored. I appreciate the support of the sponsors, and together we are teaming up to bring you unique design ideas. I know this is an INTERIOR design account, but I’ve snapped a few pics for anyone interested the EXTERIOR of our home. 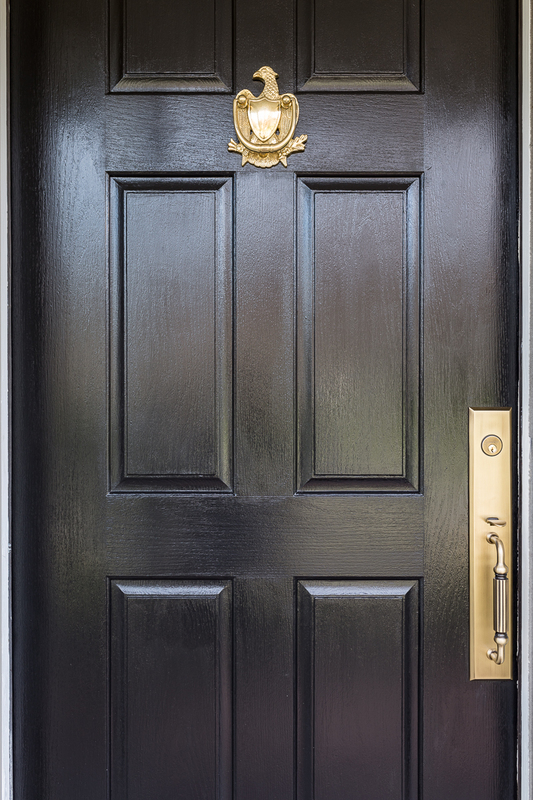 Plus, it gives me a chance to show you the new hardware I just installed on our front door. I recently purchased this vintage knocker from an Etsy shop. While I almost went with a lion’s head (shocker, I know), I instead opted for this Federalist Eagle. Bonus “wife points” to me because my husband loves eagles (and most anything patriotic, and historic) and happily approved of this design change. I (well, actually my aforementioned approving husband) also installed this GORGEOUS Fifth Avenue entryway handle from Grandeur Hardware. The quality is noticeable every time we open the front door, and it makes me want to do a happy dance. Also exciting, I was able to customize this handle to match my new interior doors in my entryway. See below. The Month of February was a busy one, chocked full of Metrie Moulding, scaffolding, wallpaper, lighting, and paint. Now that we are into late March, however, the pain has almost worn-off. 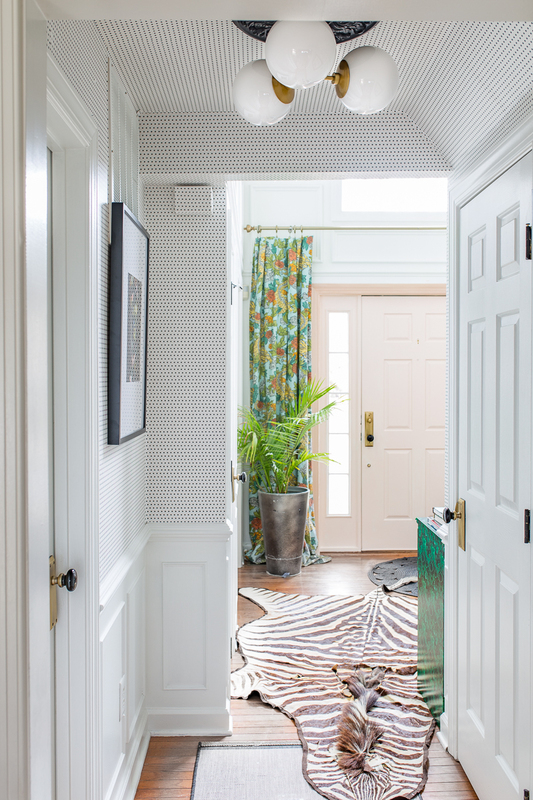 Walking into our new entryway only brings joy, and no more PTSD flashbacks. Ok, scroll through these pics and tell me if you can believe I accomplished this in the short month of February. It’s all a blur, but I’m pretty sure that I did (with the help of the hubs again). 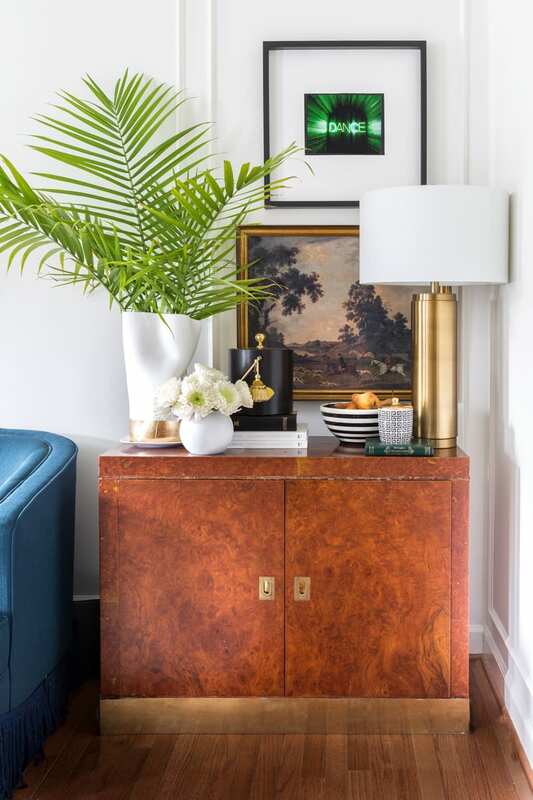 I’m still loving the transformation from of this former MALM Ikea dresser into its present day DIY malachite table state. 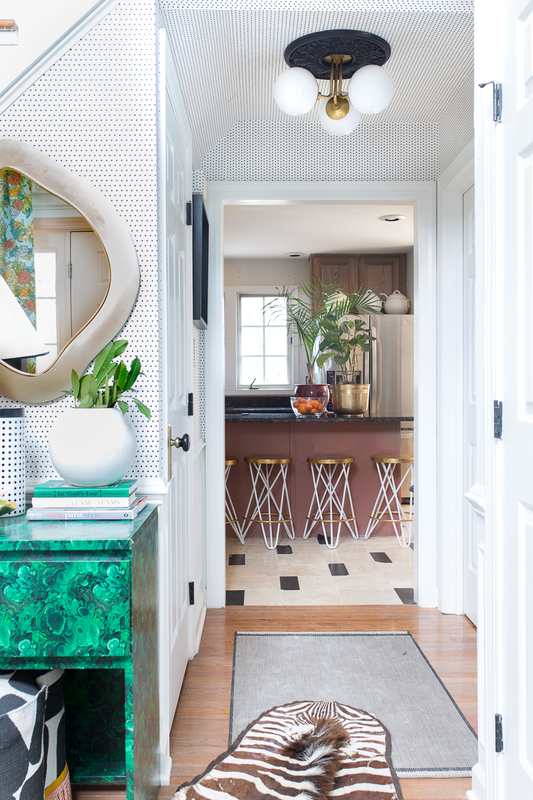 Some people were surprised that I used a simple black and white polka dot wallpaper in this space but I had three good design reasons why. 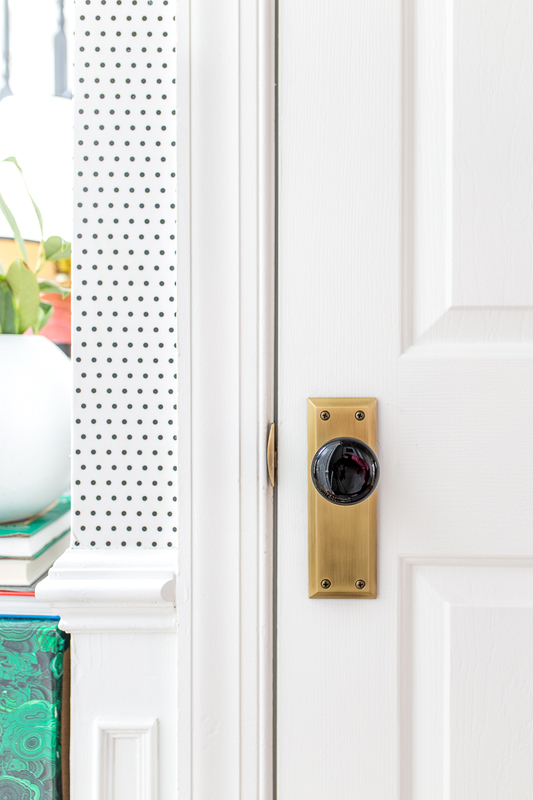 Another favorite design upgrade in this space has been the installation of stunning handles from Grandeur Hardware. I underestimated just how much of an impact this simple switch out would make. 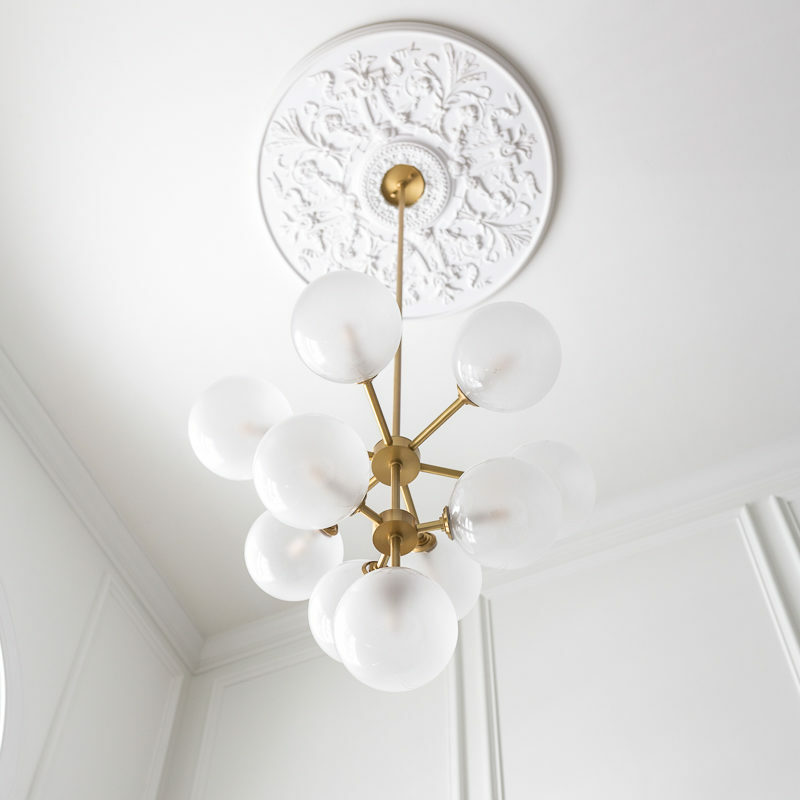 The lighting and ceiling medallion combos in this space are some of my favorite design elements. 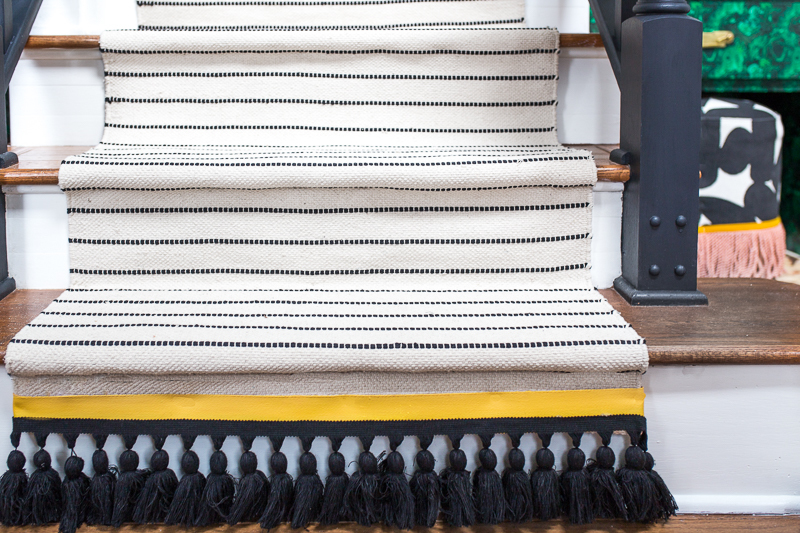 Sometimes it’s the hardest projects that make the biggest difference. 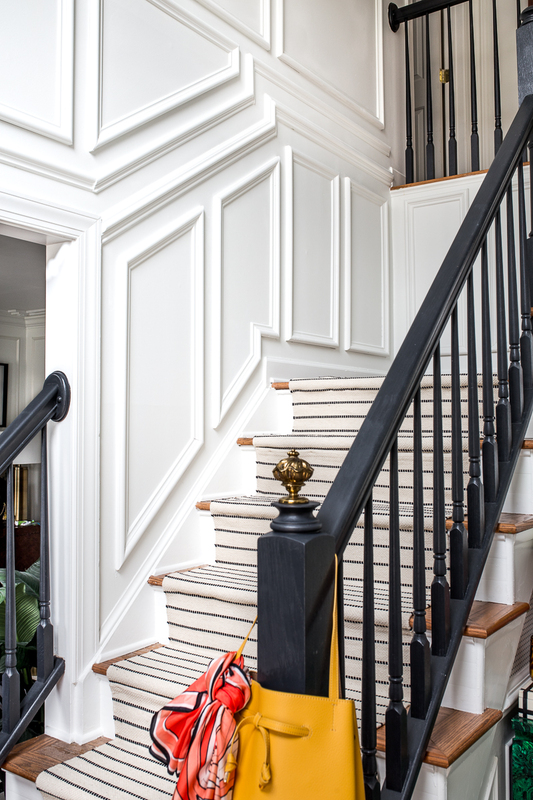 This can definitely be said for the thick chunky Metrie Moulding that we installed in our 17 ft tall entryway. I love that this will add value for years to come, and it was definitely worth the effort. 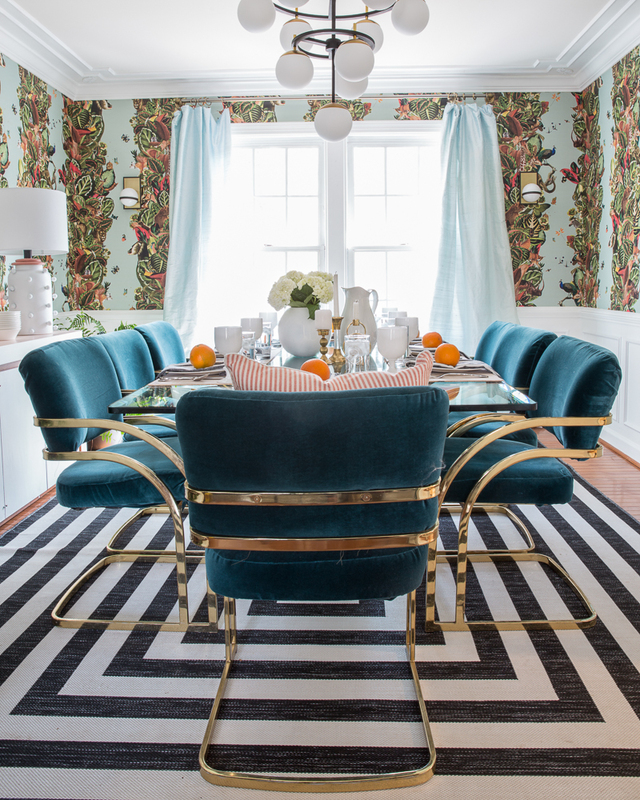 The living and dining rooms were a major labor of love during the last Fall One Room Challenge. 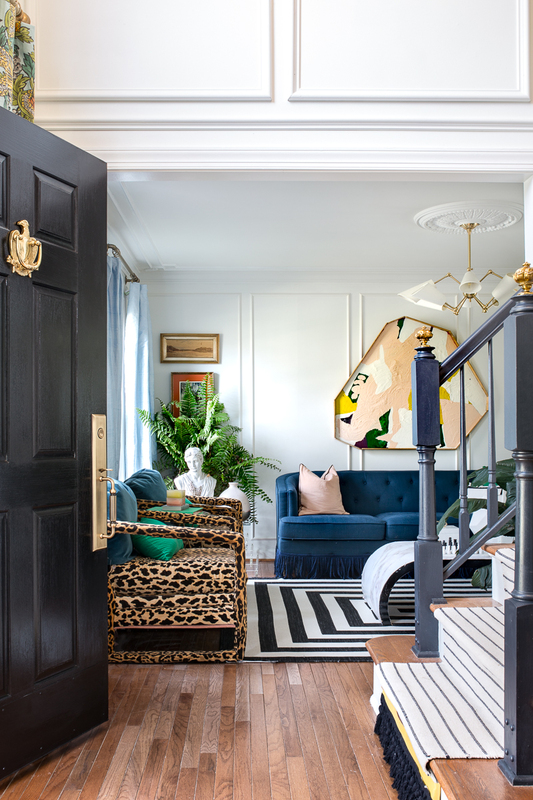 It has been so nice to have a couple of spaces that are guest friendly, even when the rest of the house has largely felt like a construction zone. 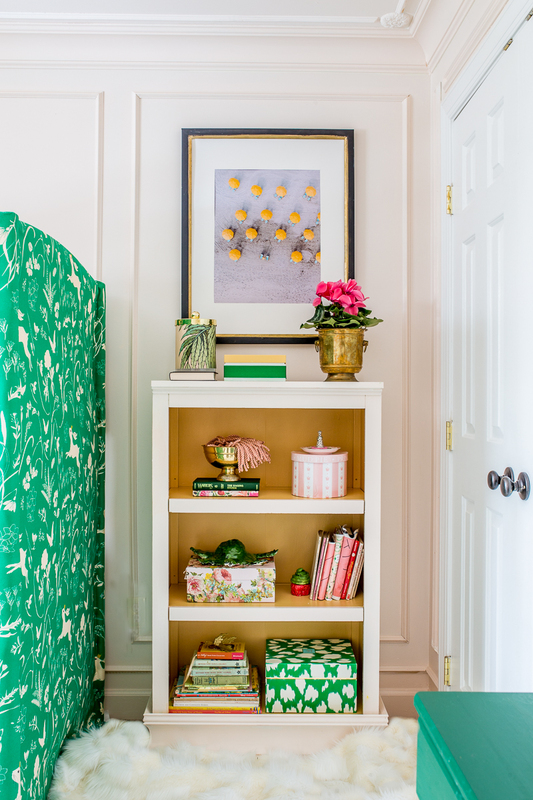 That green piano bench use to be standard wood and I upholstered it in some killer fabric. Now it has so much more personality. 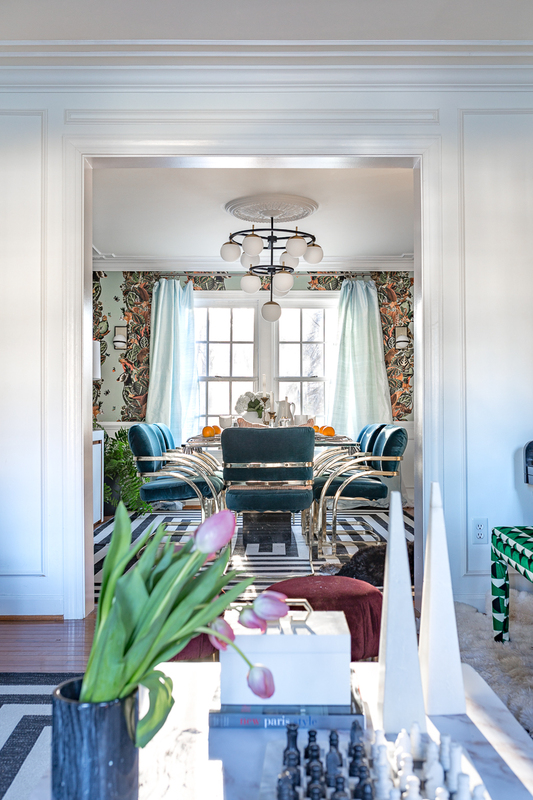 This Milton and King Wallpaper is colorful, dramatic, and almost trippy. What more could I want in my dining room? To say that it is a conversation starter is an understatement. You may remember that the VERY first room make over in the home was promised to my oldest daughter last summer. 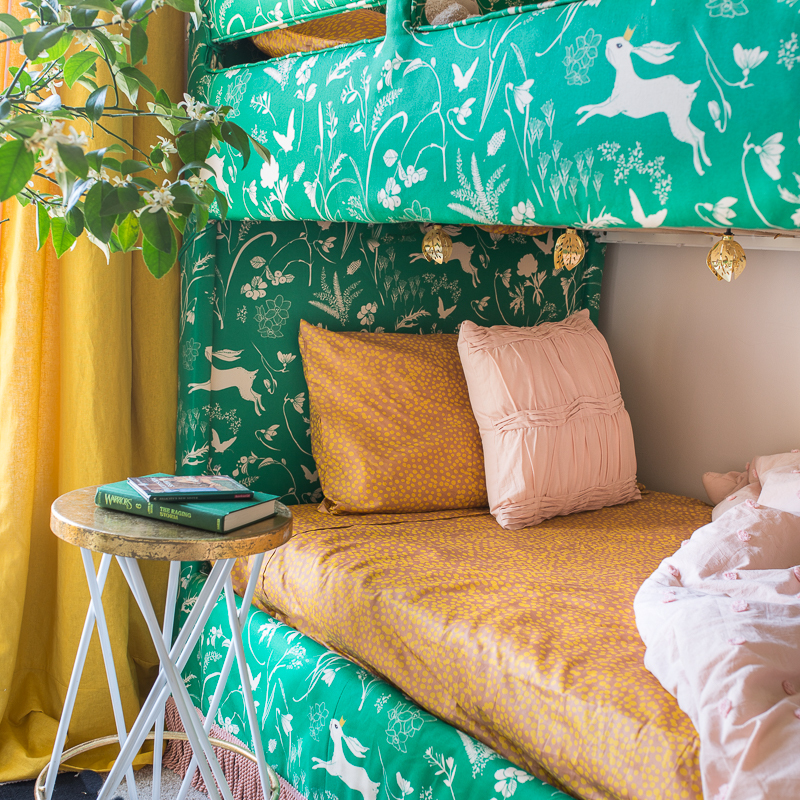 She was inspired by the teen bedroom designed by Jennifer from Dimples and Tangles, so we had to come up with a play on her daughter’s room, but in a customized way. 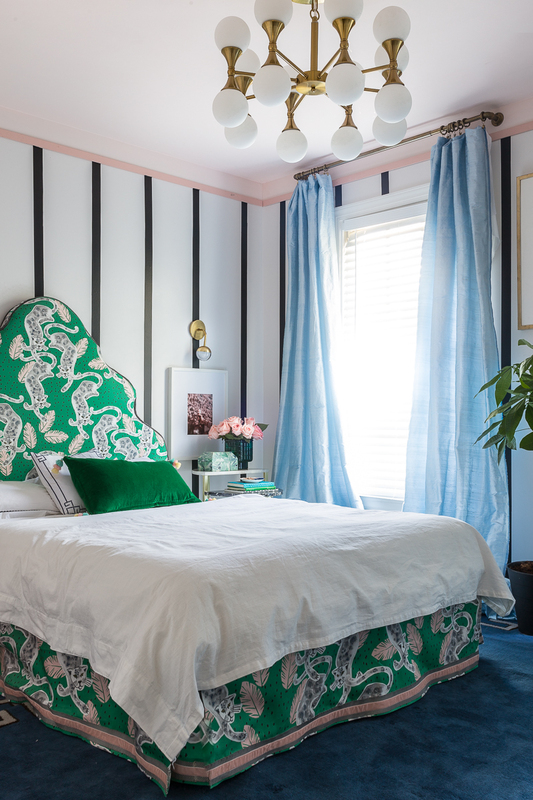 The DIY headboard was completed in one weekend, and it adds so much personality to the space. 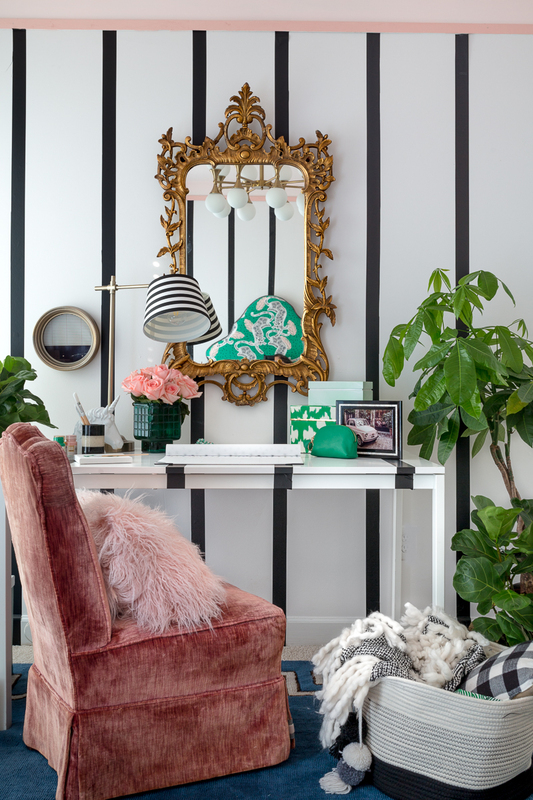 One of my favorite parts of this space is how I DIY’ed the stripes on the walls AND the desk. 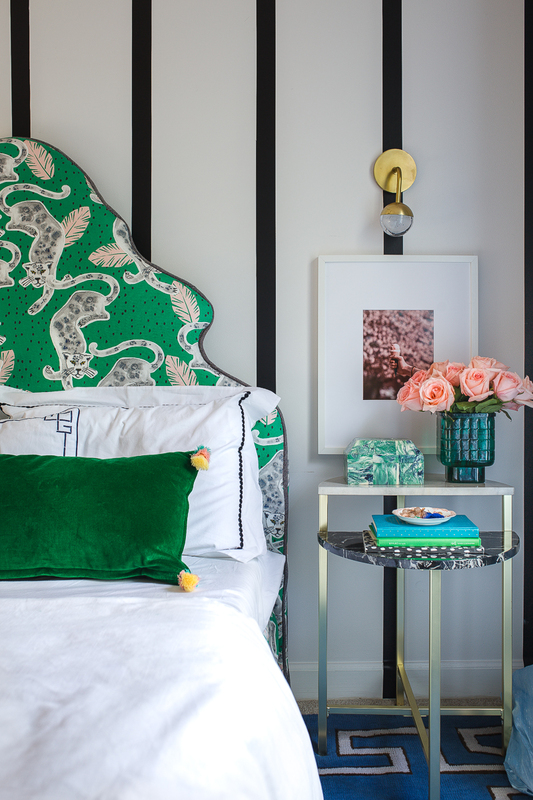 Do you want a complete list of sources and pictures with a cute Dalmatian print duvet and palm sheets? CLICK HERE for the full reveal. I think I MAY have saved my very favorite room for last…though it’s honestly hard to pick. 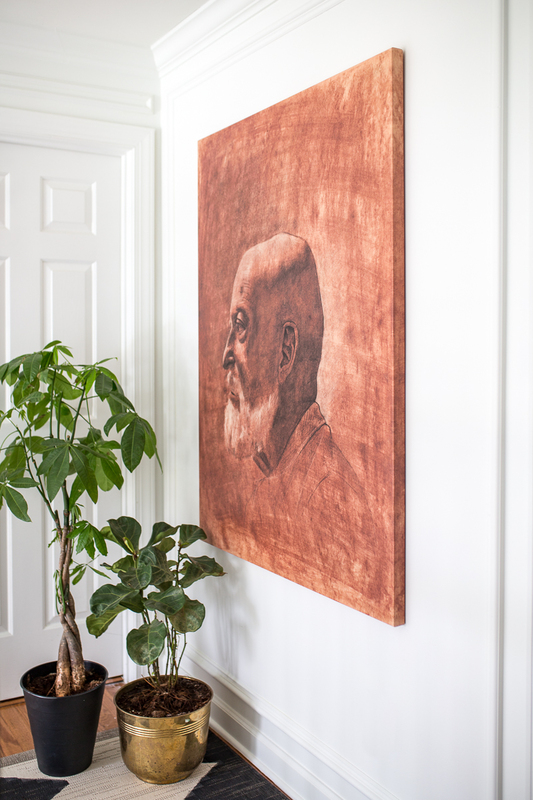 Here was the project for the month of January…and I still can”t believe how much we all love it. Yep, I had the craziest of all crazy ideas and I upholstered my two youngest daughters’ bunk bed. Wondering how in the world I got the bunk bed to look like that? I’ve got you covered my friends (no pun included)! Last week I wrote the step by step instructions for the complete upholstered bunk bed tutorial. I think there is one step in there that would really surprise you. This was our first attempt in adding crown moulding. It wasn’t a flawless effort, but I’d say we learned three lessons in the process. Note: We will be adding the same crown in our master bedroom this weekend. Also, HERE is the complete source list for this space! 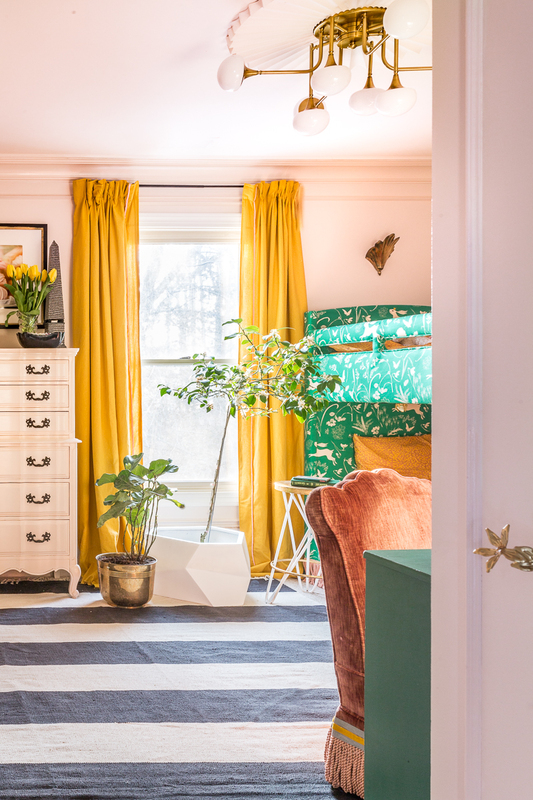 I’m ready to dive right into the Spring 2019 One Room Challenge. 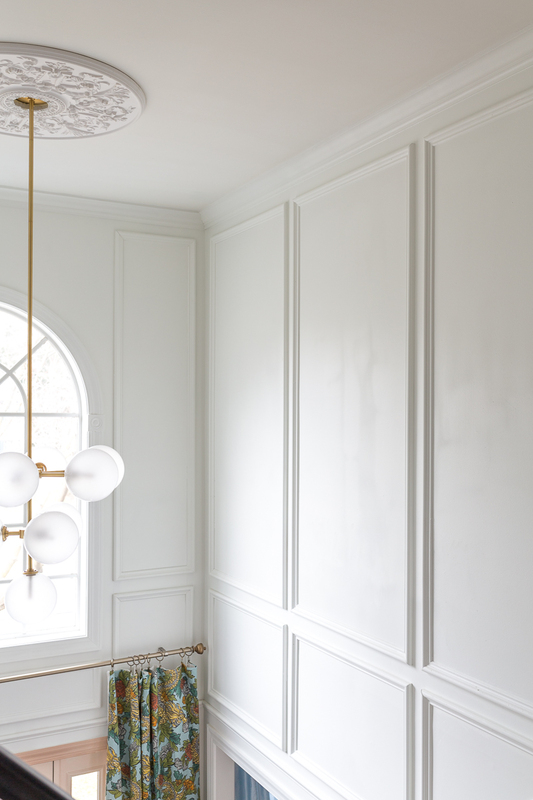 We will be tackling our MASTER BEDROOM and I can’t even wait. Don’t want to miss out? Like to follow a colorful account with over half a house left to decorate? Don’t forget to sign up for updates below or follow me on Instagram. Now, if you are anything like me, you might be chomping at the bit in anticipation over the other participants’ tours. I bet that they are going to be soooo good. Let’s go check them out, shall we? Such beautiful eye candy! 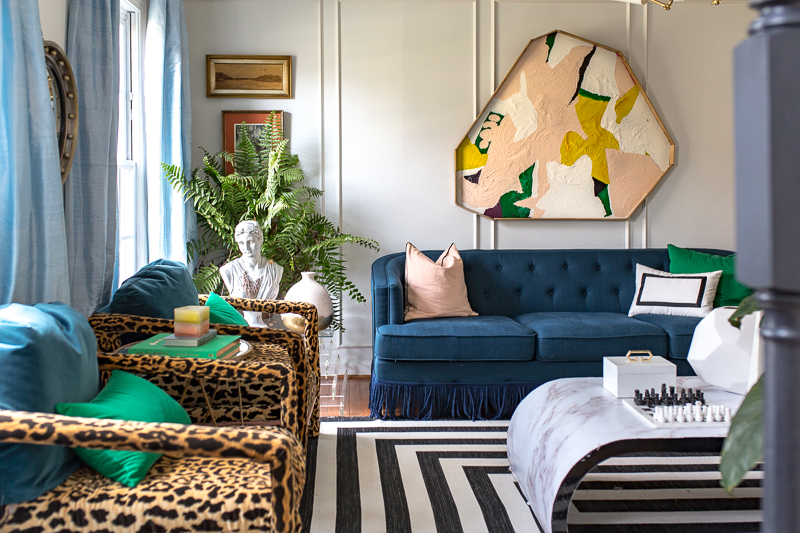 You have such a talent for mixing colors and patterns, old and new and really embracing the fact that design should be fun! 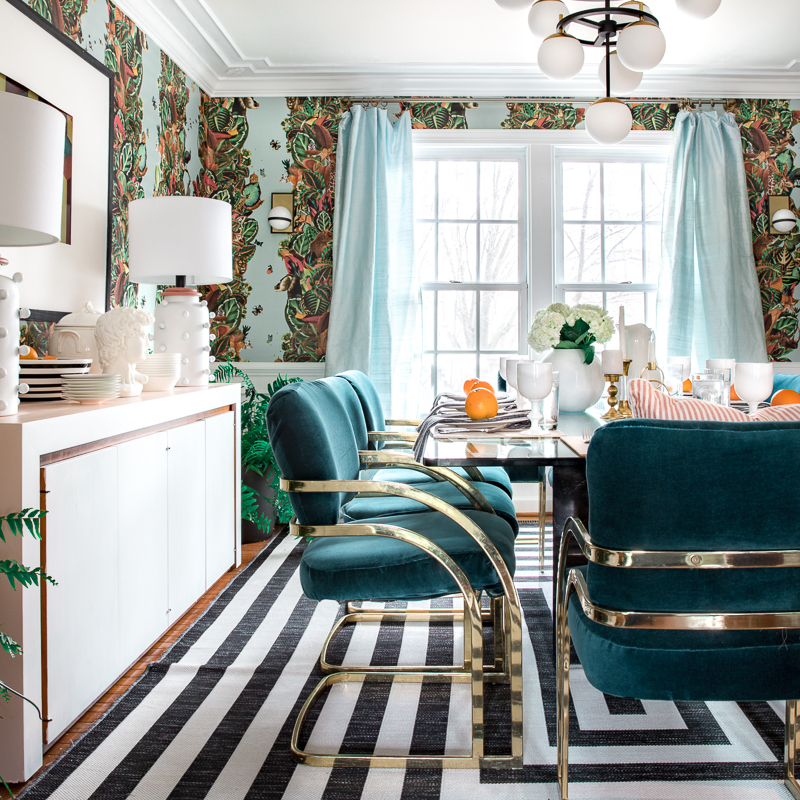 I love that you take risks like that amazingly whimsical wallpaper in the dining room! 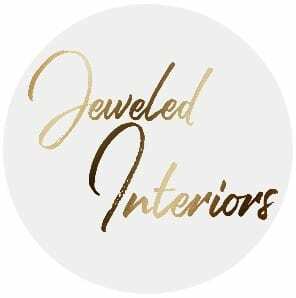 Jewel, I could just stare and stare at your home all day! 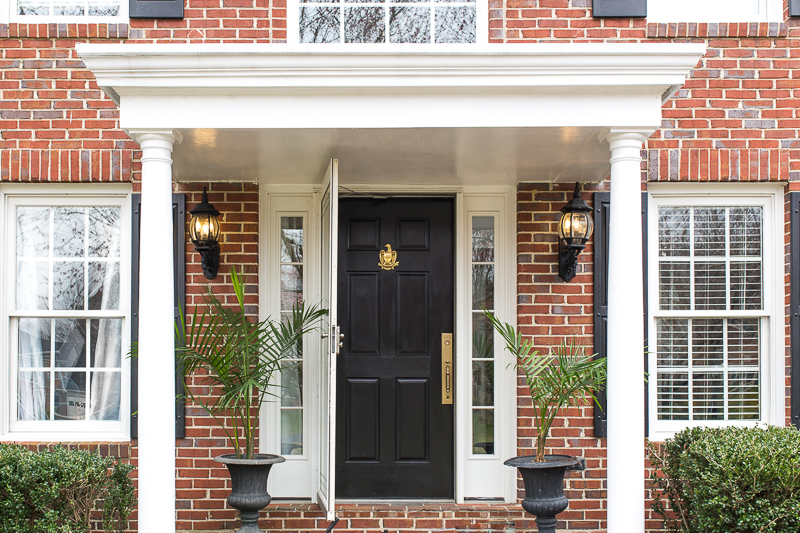 Love how your front door turned out, that eagle knocker is perfect and the new hardware is stunning! Your Spring home is perfection, so glad to have you as a part of the It’s a Colorful Life tour this week! Hi, Jewel, so happy to be in the tour with you and Jennifer and get to know you better. I’ve known Jennifer for several years now! 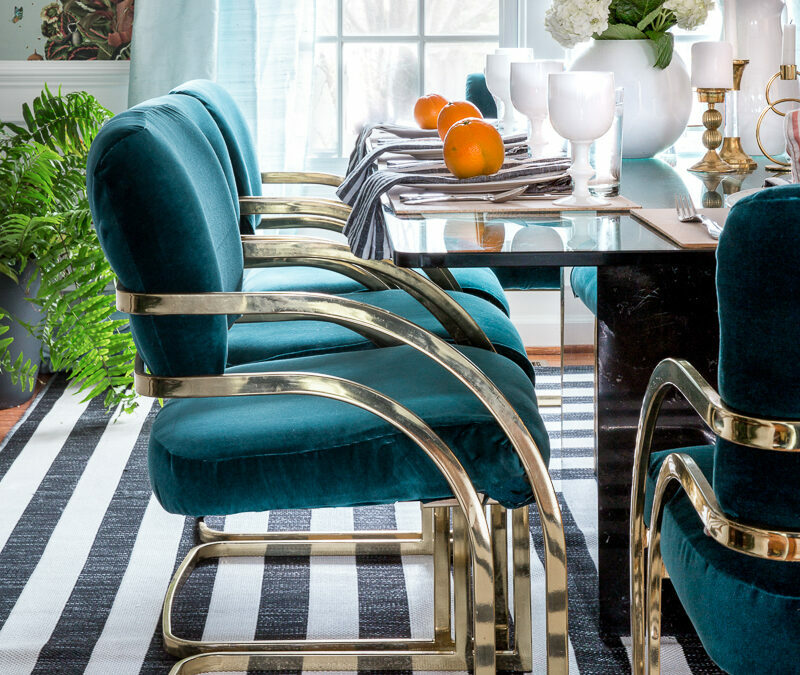 I admire all you color loving gals too and your home looks beautiful for spring. 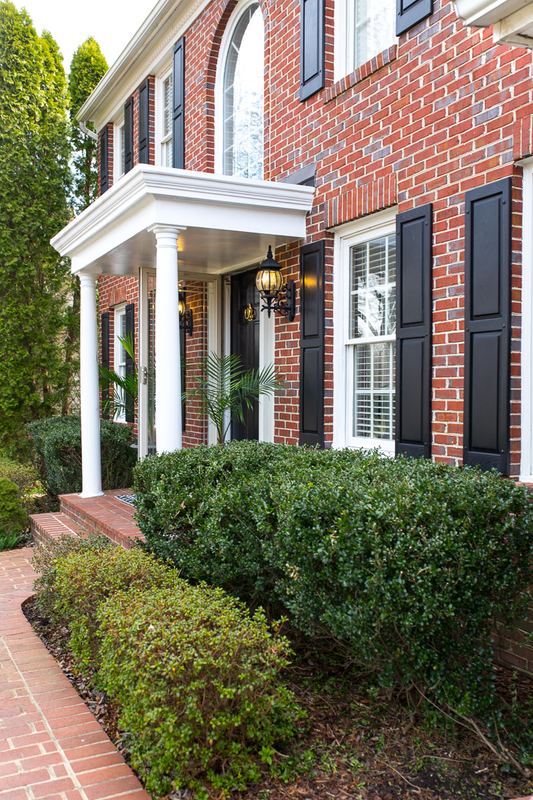 I really like your exterior brick and front entry, so inviting and traditional with the black door and hardware. I really enjoyed your home tour! Thanks Stephanie! I can’t wait to see yours too!!! It’s going to be awesome! Thanks so much Camilla! That is so kind of you!!! Thanks Rhoda- The door handles really are such a huge improvement!!! It looks so gorgeous! I love it all. I will never tire looking at your decor!! Everything is so alive and vibrant.. 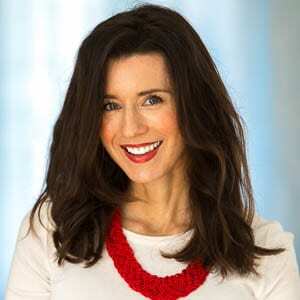 Your style is simply exquisite!! You are so sweet Jamala. Thank you so much!!!! 1. 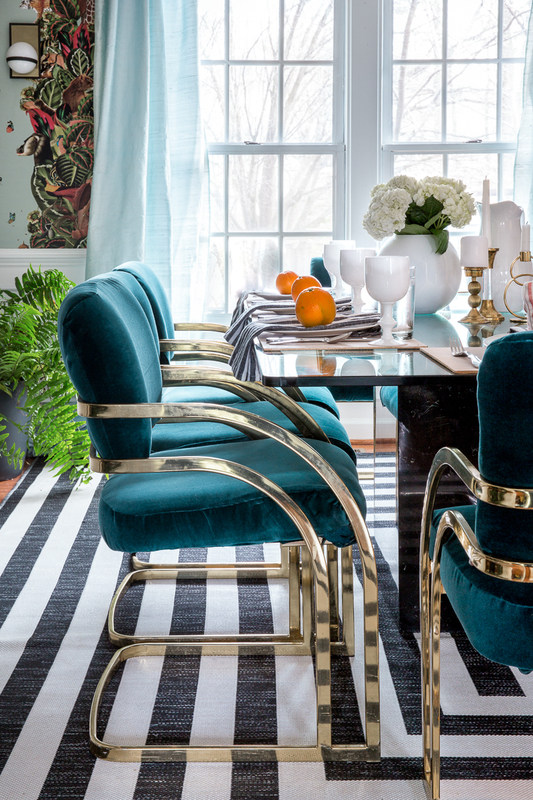 I will never not love your dining room. 2. 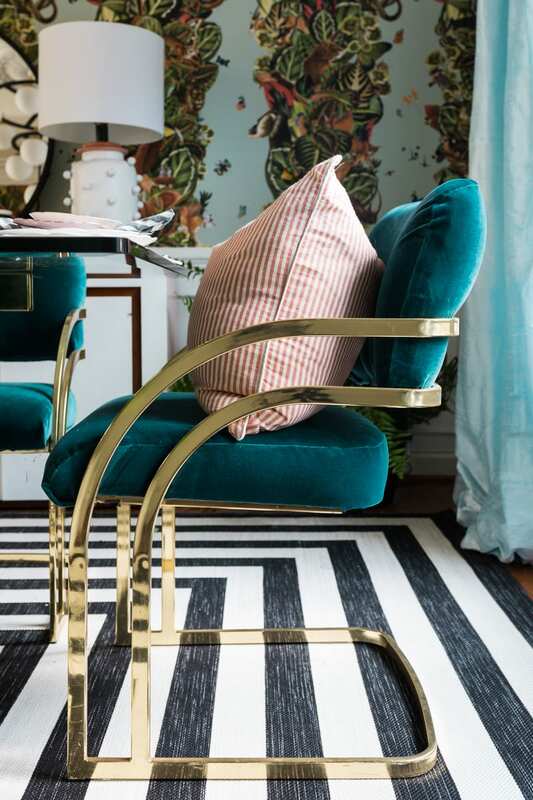 I will never not love your leopard chairs. 3. 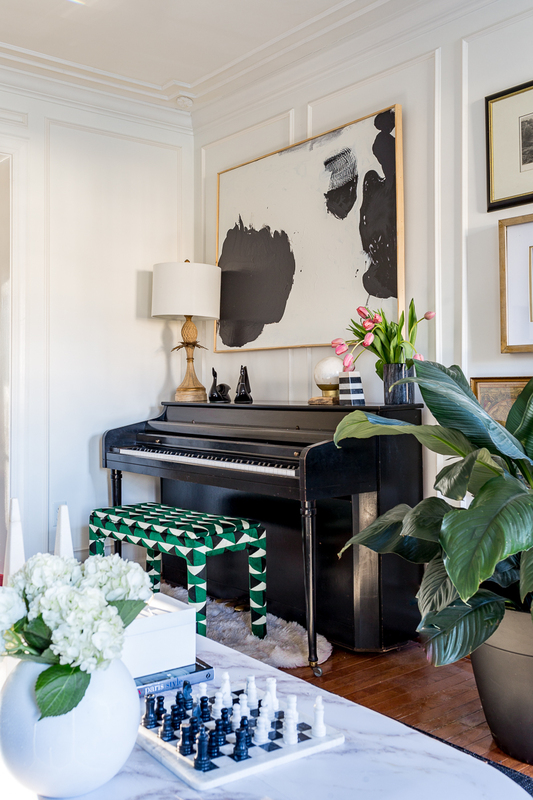 I LOVE that you upholstered the piano bench… such a fun detail over there! Love, love, love! It’s all so beautiful. That door knocker – incredible! Thanks so much! We are loving it too! Slightly oversized…just the way I like it. So when am I coming to see your house in person?! Honestly, it looks like a place I’d want tohave fancy photoshoots in while wearing my best clothes! 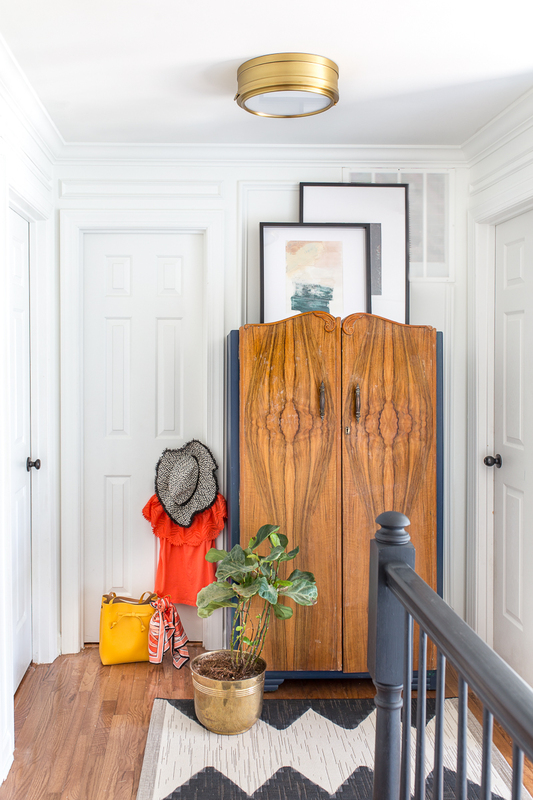 Fab house tour, looks great for spring. Any time! after the ORC that is. LOL!